According to all the evidence, we know that there were at least two main shipbuilding yards in Llanelli. Whilst there can be no doubt that there was a shipbuilding yard and patent slip alongside the Carmarthenshire Dock, there are no previous references as to the exact location of Bevans Shipbuilding Yard, other than that it was situated somewhere between the old Pemberton Dock and the Copperworks Dock. It was therefore intriguing to find an old newspaper cutting stating that Bevans shipbuilding yard was situated adjacent to the old Sailors Home at Seaside. In fact it is very likely that the Sailors Home was built originally as a residence for the Bevan family or at least was built on the previous site. Now we cut across from the old basin to the Sailors home, near which was Bevans shipbuilding yard. I dare say a few old Seasiders still remember the launching of the last vessel built there, the “Westfa”, from the slipway just on the site of the Seaside Welfare ground. On this particular occasion Seaside boys swarmed aboard the “Westfa” in order that men could release the wedges underneath the vessel, the youngsters on deck ran from one side to the other as the occasion demanded. One boy – I believe his name was Dai Thomas – fell off the wall into the water, and narrowly escaped drowning. At the shipyard they had a peculiar way of sawing through thick timber baulks. The big log was placed across a deep hole. The saw, with two handles, used by two men, one standing above the timber and the other man down in the pit, both working in harmony and cutting out planks to suit various crafts to be built on that slipway. 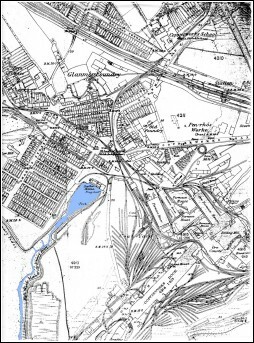 After further investigation, including a conversation with a 97 year old cousin Douglas Jones, who was brought up in Seaside, it was becoming clear that the shipyard was exactly where the Seaside playing fields and clubhouse are located today. Douglas remembered that as children, they used to slide down the sides of this huge sunken area on tin sheets before having to negotiate the steep climb back to the top. We can now confirm these memories after having seen an OS Map from the 1880s (see below) and an old photo from the turn of the century. This knowledge is crucial to the maritime history of Llanelli, as there is scant evidence today in the landscape of what was previously a bustling area employing at least 30 craftsmen and constructing up to 20 ships between1844 and 1868.These included, The Prince of Wales which was launched in 1849, when over a 1000 people witnessed it slide into the sea after the 'dog shores' were struck. The following year the wife of Llanelli's Harbour master, Leonora Luckraft, carried out the ceremony of launching her namesake, the pilot cutter the Leonora. Also built at the shipyard were the brigantine Clara Novello and the brig Hetty Ellen, which have been mentioned in a previous article and the wooden 'snow', the Gem of the Sea and the top sail schooner, Alice Williams. The Gem of the Sea seems to have had a colourful but turbulent history and it is worth noting that over a period in 1881 one of the captains was Richard Dunn, brother of the famous Francis Dunn who was tragically lost on the Franklyn Expedition to find the North West Passage. The Gem of the Sea was also fired on at one stage, by shore batteries off Tarifa, Spain with the Captain keeping the cannon ball as a souvenir! Probably the longest lasting ship built at Bevans Yard was the Alice Williams. She traded for nearly three quarters of a century between 1854 and 1928 before being wrecked on the South East coast of Skokholm Island off the Pembrokshire Coast. The crew were saved by a trawler and landed safely at Milford Haven. The figurehead of the ship has been preserved and can be seen today on the island. The longevity of these ships is testament to the quality and competence of the workforce at Bevans Yard which was eventually taken over by that prominent Llanelly citizen, David Paton. In 1913 he donated the land to the people of Seaside for use as a recreation ground. How many Seaside residents today realise that this area was once the home of a shipbuilding yard that built the the Hetty Ellen which in turn took out all the supplies needed for David Livingstone's expedition up the Zambezi river? The Gem of The Sea was lost off the west entrance to Cherbourg Harbour on the 7th of April 1885. Cambrian 19 July 1850 Launch of the 'Leonora' Built at Bevans Shipyard Llanelli. The wife of Llanelli's Harbour Master, Leonara Luckraft carried out the ceremony.